One of my all time favorite desserts is ICE CREAM!!! 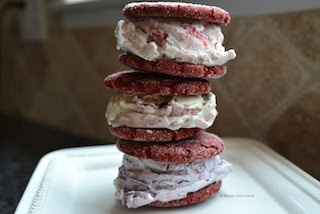 What better way to celebrate the 4th of July than having ice cream sandwiched between delicious red velvet cookies?! Not everyone has a lot of time and this segment airs on 4th of July, so for those of you who are still trying to prepare last minute desserts, this is the perfect solution! Check out the segment on the Vegas Morning Blend on Thursday, July 4th to see how to make this quick and easy recipe that everyone will love! Below is the recipe, you can make this today and have your ice cream sandwiches all ready to go for tomorrow! 2. Put enough sugar to roll cookies in a low shallow bowl and set aside. 3. In a large mixing bowl, combine the Duncan Hines Red Velvet cake mix, vegetable oil and eggs. Mix well with a hand blender, wire whisk or spatula until dough forms. 4. Form tablespoon* size balls, then roll each ball in sugar, coating the entire ball, place the ball on a parchment lined sheet pan about one inch apart. Using the bottom of a round glass, press down on the ball of dough until it is approximately 1/2 inch thick. 5. Bake for 8-10 minutes; the tops of the cookie will look crackled. 6. Once the cookies are done, allow them to cool for a minute and transfer cookies to a wire rack to cool completely. 7. Store in an airtight container with parchment paper or wax paper between each layer of cookies until ready to use. These can be made a day in advance. Scoop favorite Patriotic flavor ice cream and put on top of one cookie, top it with a bit of Chocolate Caramel & Sea Salt Sauce, then put a second cookie on top. If the ice cream is soft enough, gently push the two cookies together to spread the ice cream out towards the edges. Roll one side in blue berries, making sure they stick to the ice cream. This gives it a nice contrast of red, white and blue. Make a variety of Red Velvet Ice Cream Sandwiches and freeze them the day before. (Do not put the blueberries on if freezing the day before). Remove from freezer and serve immediately. Additional serving suggestions: Create an ice cream sandwich bar with a variety of toppings, ice cream flavors and sauces and let each guest make their own creation. This is a perfect 4th of July dessert that is fun, patriotic and easy to whip up. Note: This Red Velvet Cookie recipe is a slight adaptation from Mommy2Angels; the original recipe can be found on the Duncan Hines website. I have made a couple of minor changes to the recipe to accommodate my Red Velvet Ice Cream Sandwich recipe. The original recipe calls for powdered sugar (optional), I have changed it to granulated sugar because I like the deep red color of the cookie to stand out. I have also changed the size of the cookies to make larger ones for the ice cream sandwiches. I used a 1¾ inch diameter scooper for a consistent cookie size. My kids are always pestering me to buy those store bought ones, and as a baker I refuse on principle! What a great alternative!